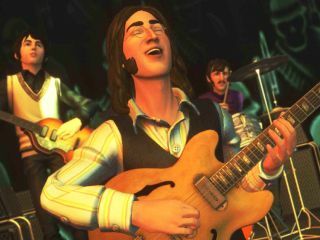 We now know 19 more songs from the upcoming The Beatles: Rock Band, bringing the grand total to 44 tracks in all. Or is it 45? MTV Games and Harmonix have hinted at one last 'mystery' song - the 45th, they say - that will be announced soon. As previously reported, Within You With You is to be coupled with Tomorrow Never Knows - said to be from the Love soundtrack - so we're guessing they're counting the two numbers as one. If not, then we'll have 46 songs. Maybe they're just trying to keep us on our toes. It was also announced this week that The Beatles: Rock Band will feature previously unreleased audio and studio banter from the group - not included on the CD Let It Be...Naked, we're assuming - as well as a "story mode" that gives the back-story of the band's songs. The Beatles: Rock Band is to be released on 9/9/09, the same day as the entire Beatles remastered catalogue.